This course is intended to introduce principles of Biostatistics, in a simpler manner to researchers who are in need of statistical application. This course is also intended to introduce principles and illustrate some of the basic methods of epidemiologic research and to improve the participant's ability to understand and use appropriate statistical procedures. The course is targeted towards researchers of varied profession such as medicine, public health, life science, social science, nursing, epidemiology, biostatistics etc. 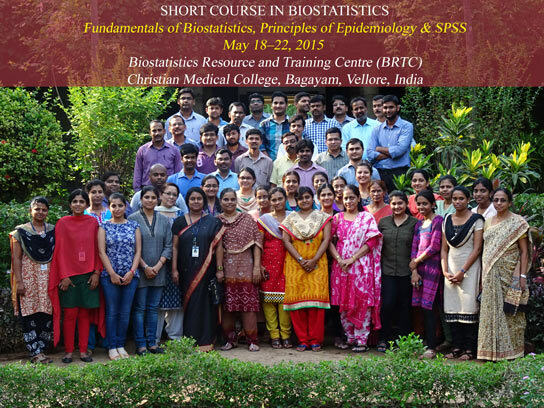 The course will be held at the Biostatistics Resource and Training Center (BRTC), Dept. of Biostatistics, (Adjacent to College Chapel), Christian Medical College, Bagayam, Vellore 632 002. Participants will have to bear their own expenses for travel, boarding and lodging. The Organizers will give Course kit, Lunch and Snacks. The organizers may arrange basic accommodation with A/C facility in the college campus on request during 1st and 2nd course -from 17th to 22nd and from 24th to 29th May 2015 only. However, there is no on campus accommodation available during 3rd course -- 31st May to 3rd June 2015. Since there is only limited accommodation available in the campus, priority will be given to the female participants on first come and first served basis. Only double sharing rooms are available. Course Fee should be paid in full by May 11, 2015.